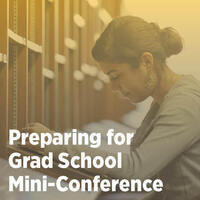 Thinking about grad school? Have we got a mini-conference for you! This two-part, one-stop program will answer your most pressing questions and help you prepare a compelling application essay. Part I Workshop (4-5:30): Your personal statement captures the essence of your desire to gain admission to a graduate program. Learn and practice strategies that will help you persuade a selection committee to offer you a spot in your selected program! Refreshment Break and Networking (5:45-6:15): Enjoy a bite and talk with current grad students and alumni as well as grad school admissions representatives. Part II Panel (6:30-7:30): Q&A Grad students, TU grad school alumni and grad school admissions representatives answer any and all questions about the application process and grad school experience.